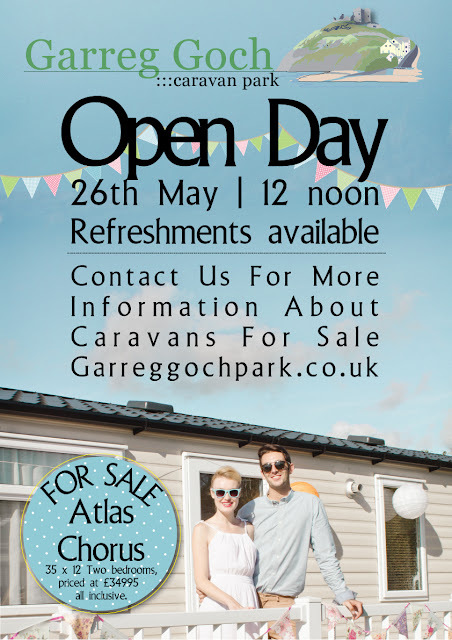 Garreg Goch Caravan Park near Porthmadog, Gwynedd is pleased to announce that this year's Spring Open Day will be held on the 26th May 2013. Entry is free and members of the public are most welcome to attend. Come along and see our latest Holiday Home for Sale, the new Atlas Corus (4) 35 x 12 x 2 beds, in addition to the recently completed new static pitch development on site. To book a site visit or stay: 01766 512210 Atlas Corus Garreg Goch Caravan Park is a Visit Wales accredited Holiday Park located in the village of Morfa Bychan, near Porthmadog in North Wales. With easy access to a long sandy beach and Porthmadog Golf Club, Garreg Goch is also a great base from which to explore the scenic delights of nearby Snowdonia.